Two juveniles, ages 11 and 13, have been charged with setting fire to a New Jersey playground over the weekend, authorities say. Both suspects were charged with second-degree arson and third-degree criminal mischief and released to their parents. Authorities had brought them in for questioning after video provided by neighbors apparently showed the two walk into Sgt. Wales Park playground shortly before flames broke out. The 5 p.m. Sunday fire was knocked down within minutes and no one was hurt, officials said, but the playground was devastated. The cost of the damage is estimated to be about $80,000, and while local authorities vow the equipment will be replaced, it might be at least a year before that happens. Neighbors say the park is normally filled with kids -- and some of those who live nearby, including Ned Sumrain's children, sat in horror as they watched it burn Sunday. 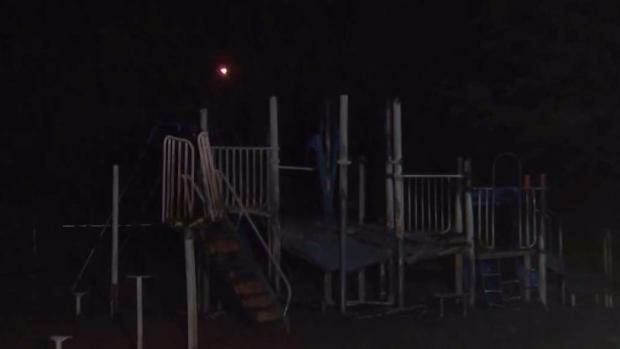 Investigators are calling the fire that destroyed a playground in Linden, New Jersey suspicious. Ida Siegal reports. Another neighborhood mother, Aliza Mayer, said, "The summer's coming up, the weather's getting nicer and this was our plan for the whole summer, and we are really not sure what we are going to do now." Mayor Derek Armstead said Sunday's blaze is the latest playground fire the city has had in recent years. The Linden Fire Department said six playgrounds have been vandalized in the last decade. It wasn't clear if arrests had been made in the earlier cases. "The people who suffer here are juveniles," said Almstead, who's pledged to replace the playground equipment and to put surveillance cameras at all playgrounds in the city to deter copycats. In the meantime, the city is in the process of removing rubber mulch from remaining playgrounds and putting up cameras in other parks to deter potential arsonists, and replace it with wood chips. "It's a bad fuel," Linden Fire Chief Joe Dooley says of wood chips. "It's a hot fuel, but there's not a lot of it."